Tip: Won’t Medicare Pay for It? After a three–day hospital stay, Medicare will cover the first 20 days in a skilled nursing care facility completely. For the next 80 days, it will cover all but $157.50 per day. And after 100 days, it won’t cover anything. Addressing the potential threat of long-term care expenses may be one of the biggest financial challenges for individuals who are developing a retirement strategy. The U.S. Department of Health and Human Services estimates that 70% of people over age 65 can expect to need long-term care services at some point in their lives.1 So understanding the various types of long-term care services—and what those services may cost—is critical as you consider your retirement approach. Long-term care is not a single activity. It refers to a variety of medical and non–medical services needed by those who have a chronic illness or disability—most commonly associated with aging. Long-term care can include everything from assistance with activities of daily living—help dressing, bathing, using the bathroom, or even driving to the store—to more intensive therapeutic and medical care requiring the services of skilled medical personnel. Long-term care may be provided at home, at a community center, in an assisted living facility, or in a skilled nursing home. And long-term care is not exclusively for the elderly; it is possible to need long-term care at any age. How Much Does Long-Term Care Cost? Fast Fact: Getting Care Now. Some 1.4 million adults live in skilled nursing facilities. Another 4.8 million remain in their own homes but get help with personal care from other people. Individuals who would rather not burden their family and friends have two main options for covering the cost of long-term care: they can choose to self-insure or they can purchase long-term care insurance. Many self-insure by default—simply because they haven’t made other arrangements. 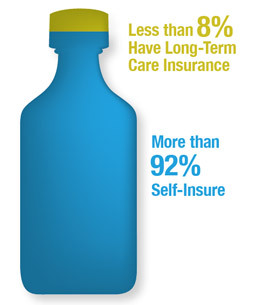 Those who self-insure may depend on personal savings and investments to fund any long-term care needs. The other approach is to consider purchasing long-term care insurance, which can cover all levels of care, from skilled care to custodial care to in-home assistance. When it comes to addressing your long-term care needs, many look to select a strategy that may help them protect assets, preserve dignity, and maintain independence. If those concepts are important to you, consider your approach for long-term care. This weekly summary gives a glimpse into the current state of recent economic news and provides insight in what we can possibly expect in the future. The information contained in this email and any attached files are strictly private and confidential. This email should be read by the intended addressee only. If the recipient of this message is not the intended addressee, please call Glenwood Investment Group, LLC 1-866-491-9675 and promptly discard this email and any attachments. The intended recipient of this email may only use, reproduce, disclose or distribute the information contained in this email and any attached files with GIG's permission. If you are not the intended addressee, you are strictly prohibited from using, reproducing, disclosing or distributing the information contained in this email and any attached files. Glenwood Investment Group, LLC advises that this email and any attached files should be scanned to detect viruses. Glenwood Investment Group, LLC accepts no liability for loss or damage (whether caused by negligence or not) resulting from the use of any attached files.